Two palm trunks mark the entrance to one of Libya’s most beautiful mosques. 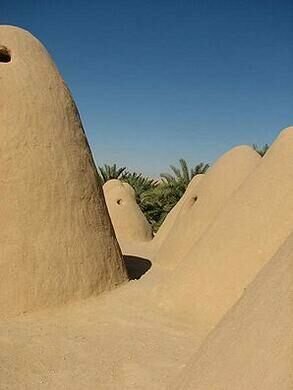 The whitewashed mud-brick structure dates from the 7th century, and greeted Muslim pilgrims and caravan routes that crossed this area for a centuries. During the heyday of the Sahara caravan trade routes, the oasis city of Awjilah was an important stop on the way to the Cyrenaican coast, bringing travelers from across the ancient world to the mosque. Nine doors grant access to the house of worship, which lead into a labyrinth of pillars and arches inside, covering an area of more than 400 m². However, the outside of the building is even more remarkable and features 21 snow-white conical beehive domes. 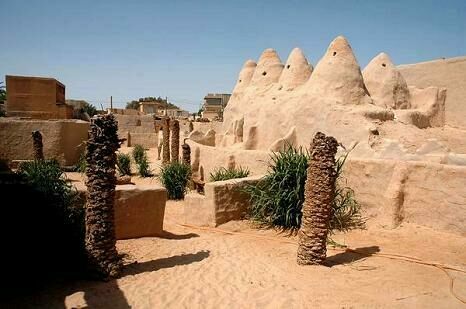 The beehives dominate the skyline of the old town of Awjilah, which was lovingly restored in 2006, after the city became one of the most convenient spots to view the solar eclipse of March 2006. As of October 2011 it remains unclear whether the 2011 Libyan Civil War damaged Awjilah, or its ancient mosque.